SCOTUS has made a ruling on the Endrew Case! Of course the interpretation of the finding is all over the place! But basically the Court has tossed the ball back to school districts and parents. That is, they declined to define FAPE, other than to declare that "de minimis" would not be the standard. A number of circuits had already reached that conclusion. They also state clearly they will not define FAPE, as the parents requested, to mean "substantially equal...," especially in light of the fact that Congress has not redefined FAPE legislatively since the Rowley decision. You can read the amicus brief CASE signed on to on the CASE website. You can read the entire finding for yourself. Below you will also see Perry Zirkel's, CEC Policy Insider's and the Disability Scoop's take on the finding. Watch for more insight from CASE in the near future. Speaking of being politically active — SELS Registration is open — have you registered? For the last 14 summers, CASE has convened a group in Washington DC to learn how to make a difference back in our district by talking with the folks up on the Hill! For the last two summers, we have joined forces with CEC to make our footprint even bigger. We were so successful, last summer we had to turn people away due to the size of the hotel we were using. This year we moved to a bigger hotel! We are so excited to be just up the road from where we were last year — same metro stop — at the Westin Alexandria. We will not be turning anyone away this year! We hope to have teams from EVERY state as we gather on Sunday afternoon, July 9-Wednesday, July 12! 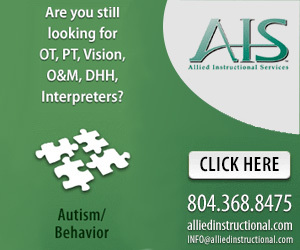 Check out the flyer and then head on over to the dedicated website and register! Don't forget to reserve your hotel rooms, too! This summer is going to be a critical year for us to help educate our congressional delegations on our communities, our students, our staff and our needs! Hope to see you in D.C.! CEC is just around the corner and CASE is always visible and active at the CEC convention! If you haven't registered yet, you can still get registered! The CEC convention in Boston is going to be amazing and a wonderful place to hear the cutting edge resources you need to take back to your district! And remember, be sure to get to Boston on Tuesday so you can join your fellow CASE members for a wonderful, full breakfast on Wednesday, April 19 sponsored by Stetson & Associates just before our annual member meeting. The meeting is always packed with information, opportunities to interact with your colleagues and discuss the major issues of the day! We will also be announcing the new CASE secretary for the 2017-2019 term as well as all the CASE award winners, sponsored by Master Teacher. Our afternoon break will be sponsored by Conover Company. The CASE Spotlight session with Julie Weatherly, Esq, sponsored by Lindamood-Bell is always a big hit. CASE Night, and other amazing opportunities ... CASE Night tickets went on sale Feb. 1 and have been selling at a clipped pace — don't miss out on this amazing night of great food, fun, and excitement at the New England Aquarium. The tickets are just $65 because of the amazing contribution our sponsors are making! Special thanks go to Star Autism, Education Modified, C-8 Sciences and Winsor Learning! You do not want to let this event to sell out so get your tickets today! Check out the CASE Night flyer. You do not want to miss any of the CASE activities at CEC! Not a member of CEC? Why not join now! Oh, and by the way, did you know CEC will not be in April in 2018? No, it will be Feb. 7-10 in Tampa, FL! And because of this change, the time is NOW to submit your proposals for the CEC convention for 2018! Be sure to mark you calendars and get your proposals ready — you will not want to miss the great professional learning opportunity the CEC convention provides! It's that time of year ... did you know we have a CASE Career Center? and the CEC Career Center! If not, you need to check them out today! Besides the links provided here, you can find the CASE Career Center on the CASE Website home page on the top left hand side and the CEC Career Center can be found on the CEC home page by going to the RESOURCES tab and it is listed in the drop down menu. Time is ticking away — Have you put in a proposal for the 2017 CASE Annual Conference yet? Kindel Mason (ID), CASE Professional Development chair and his committee have been working hard to get the call for proposals out! The call will last from now until April 24. The 27th Annual CASE Fall Conference will be held at the Nugget in Reno, NV, Nov. 2-4. Now is a great time to get your "act" together and submit a proposal! Just remember, all presenters do have to register for the conference! The committee plans to be able to inform presenters in time for them to register at the cheapest rate — Early Bird! So, get those proposals in! 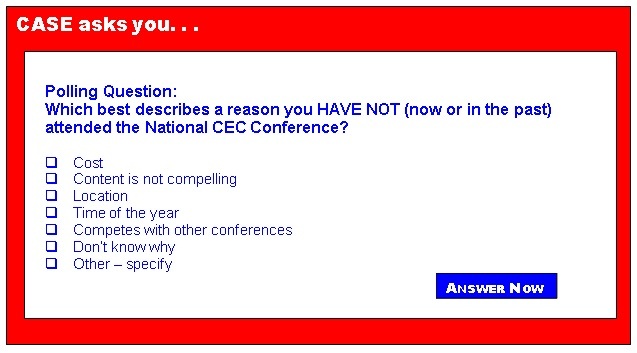 The question last week was "how often do you attend the National CEC Convention?" First place at 56 percent was always. There was a three-way tie for a very a distant second at 13 percent between frequently, sometimes, and never. In last place at 6 percent was only once. As mentioned above, CASE is very active at CEC but perhaps more importantly is the great content and experience you receive from attending the premier professional development event of the year in the area of Special Education! When I was assistant superintendent of a district with about 27,000 students, I built into my IDEA budget to take 2 teachers to the CEC convention each year. I always went and one of my biggest professional satisfactions during those years was to see the excitement those teachers had — I took different ones each year and I know it was something they never forgot. I also built in the money to take 10 of my teachers to the State CEC convention. As you build your budget for next year, consider the professional learning your teachers can get from the experience both at your state/provincial level and national/international level by attending CEC. Did you know CEC put out a toolkit for how to "justify" attending? Check out the Justification Toolkit today! As many as eight million school-age children in the U.S. are left alone at home before and after school (estimate by the U.S. Department of Education, 2003). These unsupervised times can lead youth to become involved in juvenile crimes, or experiment with alcohol, tobacco, drugs, or sexual activity. Students left unsupervised are also more likely to become victims of crime or be involved in car crashes (Miller, 2007). Additionally, younger children may engage in dangerous play while home alone. Before and after school programs serve children and families during the critical times when children are not in school. These programs provide students with supervised, safe activities that may also increase academic and social skills, as well as providing opportunities for academic tutoring and social mentoring. What education programs could still be vulnerable in Trump's budget?